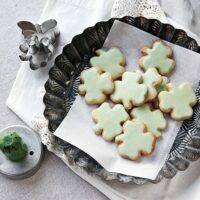 Shamrock Shortbread Cookies are classic shortbread cookies cut into shamrock shapes and glazed with green icing. 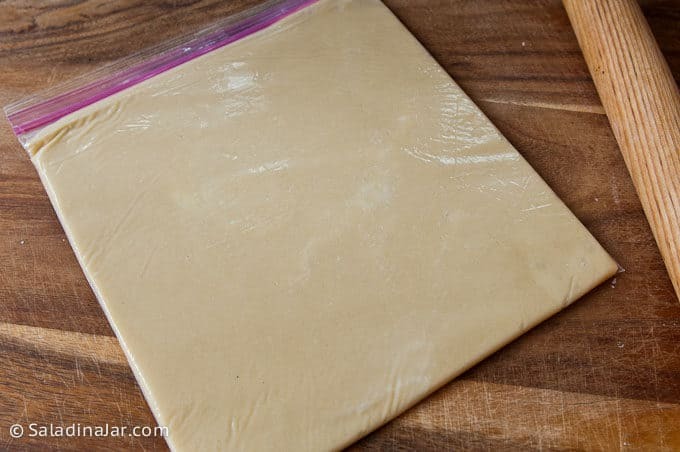 Use a Ziploc bag to roll out dough for easy clean-up. Do you celebrate holidays at your office with food? Somebody at my work decided we should all bring green food for a potluck in March. I threatened to bring a green salad. Then I remembered my favorite shortbread cookies. You will need few ingredients and even less talent. 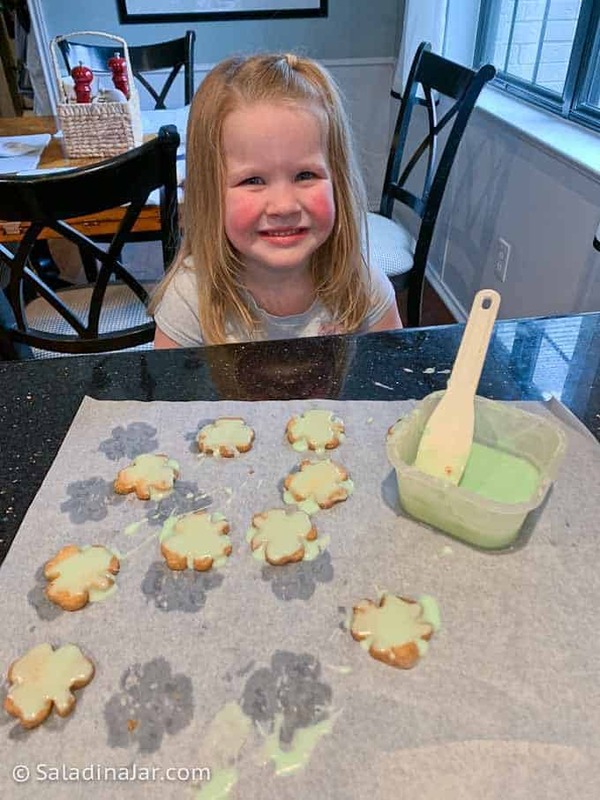 A miniature shamrock cookie cutter, green food coloring, shortbread cookie dough, and a simple frosting. That’s it! The best thing about these cookies? 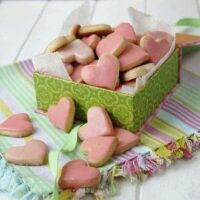 If you haven’t tried these cookies in any of the various forms I’ve already blogged about (Pink Shortbread Cookies and Iced Shortbread Cookies for My Valentine), you may not realize how easy they are to make. Unfortunately, rolling out the dough can be a sticky mess. That’s where this secret I learned from Dorie Greenspan comes into play. 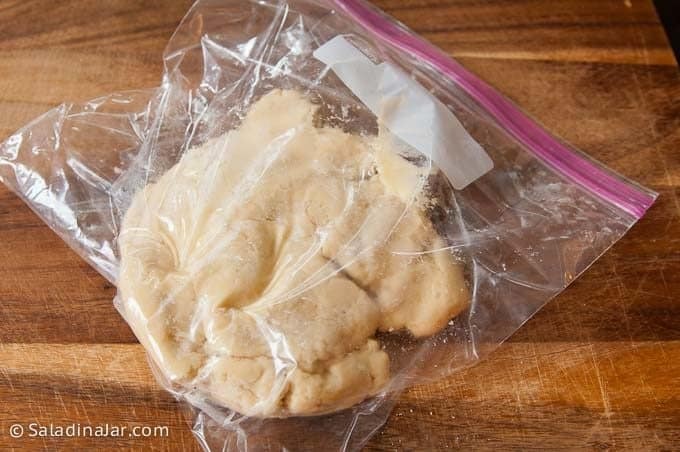 How to roll out shortbread cookies using a zippered plastic bag. Simply put the dough into a Ziploc bag and seal. Roll the dough to a uniform thickness that fills the entire bag. 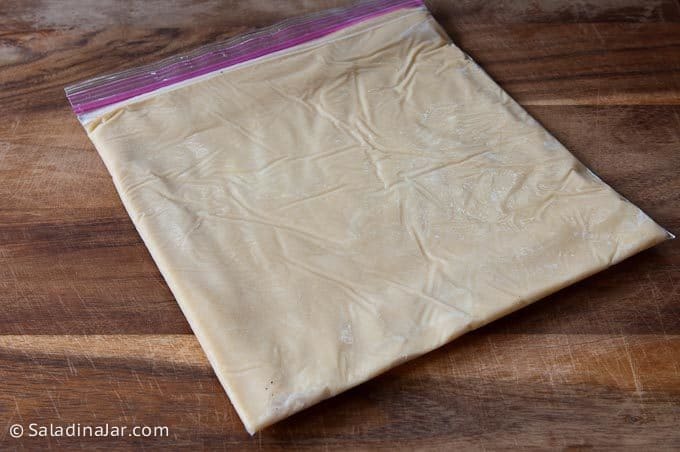 Place bag into the freezer and chill the dough until hard. 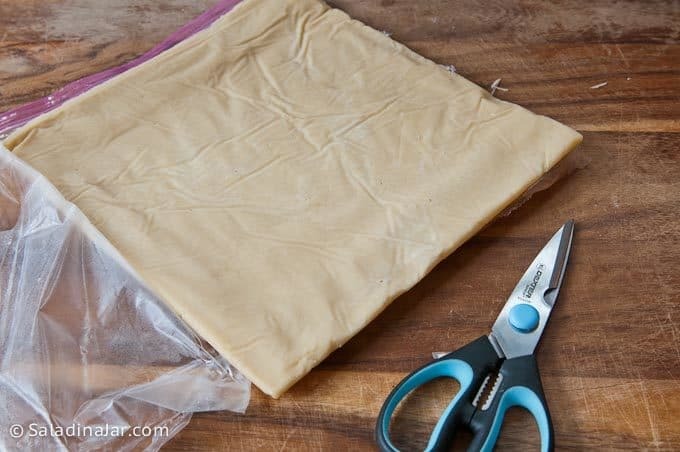 Uncover dough by trimming two edges and unzipping the top of the bag. Pull back the plastic. 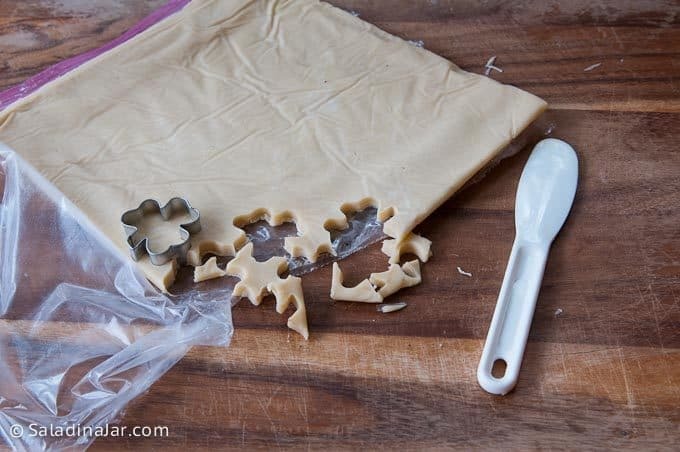 Open the bag on 3 sides and let your cookie cutter go wild. Because dough has been thoroughly chilled, the cut-out cookies are easy to pick up with your hands or peel off the plastic before transferring to a cookie sheet, ready to bake. 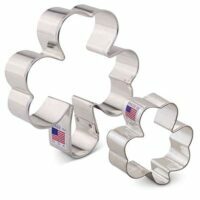 Use cookie cutters of choice to cut out cookies. You may need to use a toothpick or dull point of a knife to extract small pieces i.e. legs, tails, stems, etc. Clean-up is as simple as throwing the bag away. No flour to sweep up. 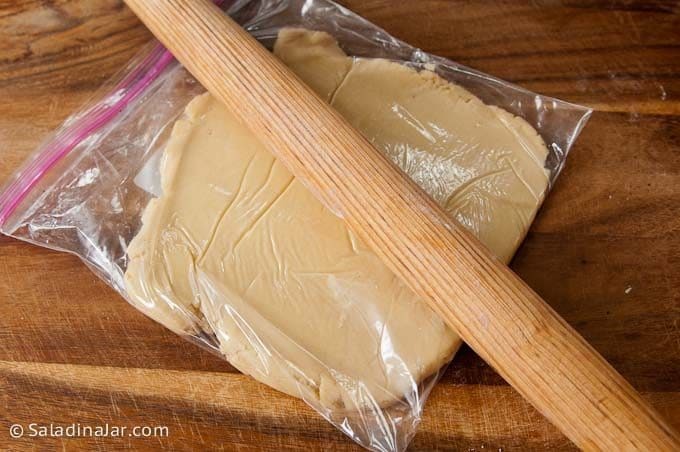 No sticky dough to scrape from your counter or cutting board. 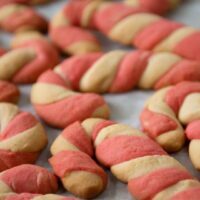 Dorie’s technique is adaptable to almost any roll-out-the-dough-and-cut-into-a shape recipe. Give it a try! My little taste tester. 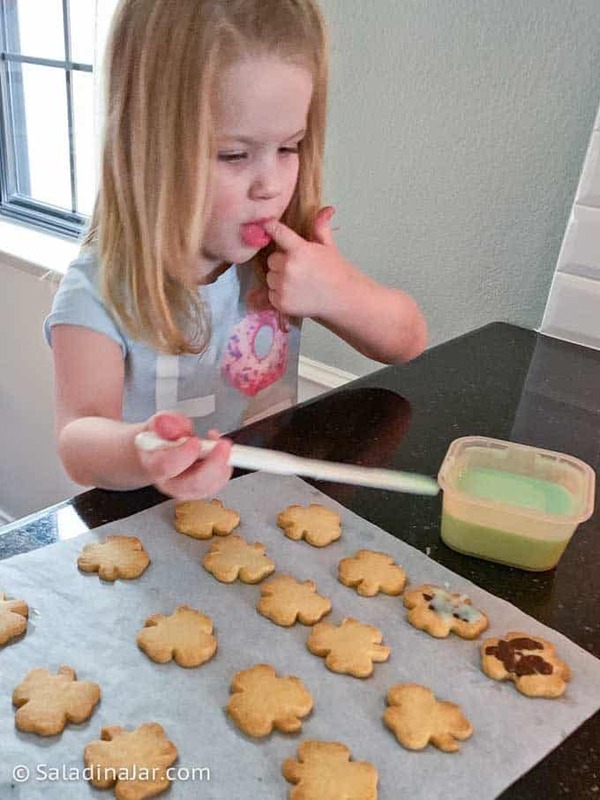 She wanted to add chocolate to a few of the cookies. Not bad. Not bad at all! 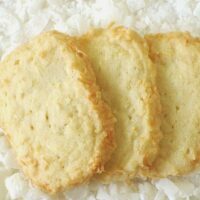 WARNING: These shortbread cookies taste fantastic straight out of the freezer. I suggest you double wrap and hide if you have freezer moles at your house. A fun cookie to make with kids. They will love eating them, too. Combine butter and sugar into a large bowl. Beat on medium-high speed until fluffy. Add vanilla and beat until combined. Combine flour and baking powder separately. Add slowly to butter using low speed. 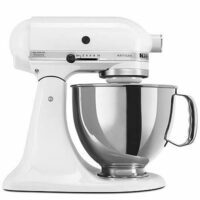 Stop beating as soon as the flour mixture is incorporated. Over-beating will result in toughness. Form the dough into a slightly-flattened ball. 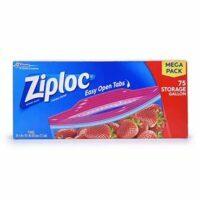 Place into a zippered plastic bag. Chill about 30 minutes. With bag cracked open slightly to allow air to escape, roll dough until evenly distributed throughout bag. Place back into refrigerator until firm--at least another 30 minutes or up to 2 days. Can be frozen at this point. Remove cookie dough from fridge and carefully cut two sides of bag with kitchen shears or scissors, leaving one side intact. Lay top layer of plastic back and use cookie cutter to make cookies. Because the dough is cold and firm, they should peel off the plastic easily. Place onto prepared cookie sheet. Re-roll scraps after replacing plastic over top of new ball and refrigerate a few minutes until firm again. Repeat as needed until all dough is used. Bake 10 to 12 minutes, until light brown around the edges. Time will vary greatly depending on the size and shape of cookies. Check early and often. Cool 5 minutes before removing to cooling rack and wait until cold before icing. Whisk together the powdered sugar, milk, and extract. If too thick, add more milk a few drops at a time. 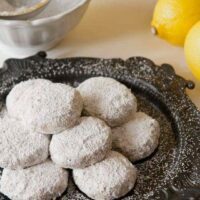 If too thin, add more powdered sugar or let sit for awhile. Tint with food coloring. Ice cookies and allow to rest until dry. I prefer to turn cookies upside down and dip into icing just enough to cover surface. Goes faster, although a little messy, until you get the hang of it. Store cookies in an airtight container at room temperature up to 1 week or tightly wrapped in aluminum foil or plastic wrap for 1 month in the freezer. Recipe adapted from The Pastry Queen by Rebecca Rather. Technique inspired by Dorie Greenspan. The post “Shamrock Shortbread Cookies” was originally published in 2011. Updated and republished in March, 2019. 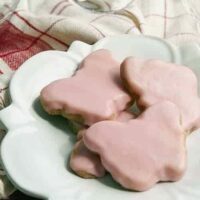 A simple but delicious shortbread cookie with a smooth butter icing. Kids and adults alike love these. Ruth's Shortbread Cookies with Milk Chocolate Toffee Bits are simple shortbread cookies with dipped in chocolate and decorated with more toffee bits. 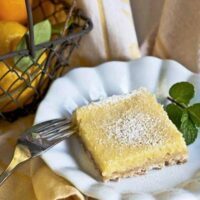 They are more trouble than opening a package from the store but the taste of these homemade graham crackers is over the top fresh and downright wonderful. Made with whole wheat, honey, and brown sugar. Do you think these would work with peppermint extract in Christmas Shapes? Can’t wait to try these. I have sooo many ideas. Pink hearts as you mentioned for Valentines Day, lots of pastel eggs for easter. Red maple leaves for Canada Day, (or for my American friends red, white, and blue stars for July 4th) red orange yellow and brown leaves for back to school or Autumn. Brown turkeys and those previously mentioned leaves for Thanksgiving. How about white ghosts, yellow moons, black bats and orange pumpkins for Halloween. It’s endless. I’ve been wanting to try this cookie recipe and I finally got around to it today. They were easy and tasty! Thanks for all the great recipes and pictures! What gorgeous cookies AND opening photo! Is that pie/tart pan? Stunning…. and who wouldn’t like this site? I think your co-workers are nuts… 🙂 Beautifully-glazed cookies – they’re perfection. I made sandwich cookies. Huge ones… not nearly as nice though! oh that’s what you needed the cake picture for! Cool! I love the farmhouse cake, so creative! Love your cute cookies, Paula. Your niece Gina’s wedding cake is incredible. Wow, so much talent! One word for these cookies….. FABULOUS!!!! And you know if I can do it, anybody can! I think they are the new official cookie of the Gainer Household. My kids prefer them without the icing, but I say keep the icing coming! Thanks Der. Glad they were a hit. Sounds like unsalted butter worked just fine. These definitely need to be a “sometimes food.” I eat way too many when they are in the house. Lovely looking shamrock cookies. What size of cutter did you use? The only one I can find in the UK is 12.5 cm (5 inches) which seems very large! Love the idea of the green icing. As always, marvellous! cute shamrocks! your photo of them is beautiful. I love this post!!! I always enjoy hearing about the family and seeing their many talents. I never knew your mom made cakes. That wedding cake Gina made, It was awesome!!! Right now though I would settle for one of or two of your cookies. Yum! How did you know that I love shortbread cookies right out of the freezer? These cookies are adorable. Slainte! Beautiful slide show of beautiful decorated cakes. The cookies look and sound delicious too! Pretty pastel green frosting. You are too clever–labeling cookies as Brussels Sprouts. I’m pretty sure that would work at my house–until they catch me eating a cookie and insist on knowing where I found it. Freezer moles and *get it done yesterday gene*…you are too funny. The cookies are too cute and I enjoyed the streaming video of all the cake bakers/decorators in your family. As good as your salad in a jar may be, I’m sure that your co-workers appreciated these little shamrock cookies even more. Wow I love your cookies! I also have another question as I notice you use the same theme as I do for one of my blogs (www.frogbites.nl) but I cannot get a good plugin for comments but yours seems just like the one I need. Can I ask which one you are using? Hi Simone, I use CommentLuv, ReplyMe and Akismet. Not sure exactly what you’re looking for but hope that helps. Thanks for stopping by. Love the pictures of the cookies and the cakes. Wish I had the “baking” energy that you have. But I thought you were making a cake today so am surprised to see the cookies. Oh… maybe the cake is coming up?? 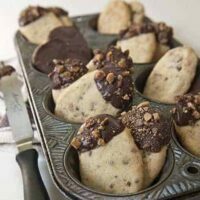 Wow, those look so cute 🙂 I never thought of pressing the cookie dough out in a ziplock bag, what a neat idea! These are so simple and festive for St. Patty’s Day! Love, love, love the slideshow!!!! We definitely have some talented people in our family!!!!! I plan on making these cookies this week… but I only have mickey mouse cookie cutter… I think that will work! Agreed on the family decorating talent. Mickey mouse will work just fine and I can imagine how tasty it will be to nibble on his ears. Your cookies are just adorable. I’m definitely not a cake or cookie decorator either, but the wedding cake is pretty impressive. Thanks Kalyn, Sounds like we are kindred spirits when it comes to decorating–lots of other areas too. How are you doing these days? Finding a new normal without our dads is difficult–don’t you think? Some days better than others. Same for you I suspect. Ok, I remember these cookies from your previous posts and am *so* making them for work this week. Timing of your post is perfect as I was looking for a good, easy green cookie to bring in. I will report back! Thanks for this one, Paula! Can’t wait to hear. Meanwhile, I’m enjoying your pound cake series. I really should invest in some food coloring. 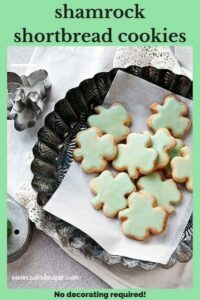 These sweet little bites would be a nice treat to send with my fiancée who has a cross-country flight on St. Patrick’s Day! I use the cheap food coloring from the grocery store although I’m told the paste is better. Your fiance will be thinking very nice things about you if you send these with him. Guarantee it. You are probably correct about that. Happy weekend to you and yours!